While agriculture continues to wave change, one Yorkshire area of unspoilt beauty still thrives on traditional methods of farming. Danusia Osiowy visits Malham to meet one farming couple whose integrity is at the heart of their business. On what is the hottest day of the year so far, the spectacular backdrop of the Yorkshire Dales is one sight to behold. The rolling hills of limestone scenery hills, miles of drystone walls and its grazing livestock, makes Malham a photographer’s dream and a go-to haven for thousands of tourists each year from across the world. 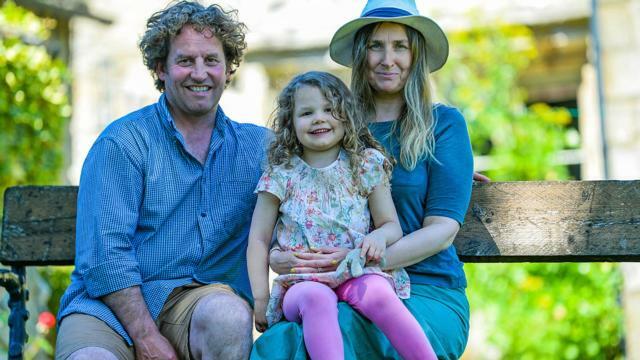 Its renowned location is also the reason why Neil and Leigh Hesseltine decided to change the focus of their family farm business and work more with the unique land surrounding their doorstep. Neil and Leigh with daughter Violet. The third-generation husband and wife team took over Hilltop Farm from Neil’s father, who had managed the tenancy until the 1980s when an opportunity arose to buy it. But the ownership bought with it its own problems during a struggling economy. Neil says: "Interest rates were loutish at the time at about 17 per cent and the farm income was falling. My father was farming 40 suckler cows but decided to come out of it as he wasn’t making any money." Around the same time visitor numbers to the picturesque village were increasing and, after seeking advice from fellow farmers who had diversified, converted an old shed to Bunkhouse Barn in 1987. After graduating from Seale Hayne College with a Higher National Diploma in agriculture in 1993, Neil travelled and then embarked on a semi-professional rugby career playing for Wharfdale Rugby Club for 10 years. By his own admission, his passion for farming has come later rather than sooner in his life, as he has found his own way through lessons learned. "When I was younger I was never obsessed if you will about the need to farm. I did know it was where I eventually wanted to be but I feel with me, that need came later." With the family farm unable to provide much work let alone a paid wage, Neil worked as a relief milker and general farmworker for other local farms while balancing rugby alongside. But in 2001, when foot-and-mouth hit, he was unable to work on the local farms that had been taken out, so it became the trigger which saw him return to the family farm. At the time the family were managing 400 Swaledale cross ewes across 162 hectares (400 acres), but gradually Neil increased numbers to 800 across 445ha (1,100 acres) through a mixture of ownership, private rentals and conservation agreements. In 2003 the couple were approached by the National Trust to participate in the Limestone Country Project, an initiative led by the Yorkshire Dales National Park and funded by the EU. "Research had revealed over a period of time the number of cattle on the hills had reduced but the number of sheep had increased, changing the diversity in the area. "The project aimed to get cattle numbers out to graze the limestone pasture and get these numbers up again." Keen to help preserve the area they have traditionally farmed, the couple agreed to become involved and bought-in 19 Belted Galloway thanks to funds they were given from the project. "I made contact with some known breeders in Scotland," explains Neil. "We took a weekend out to travel up there and go and visit the farms, learn more about them and we bought our first lot. "Managing rare or native breeds was one of the stipulations of the project. They needed to be able to survive the harsh winter months we get up here, so I chose the Belties for their hardiness and their aesthetic. Although, with the benefit of hindsight, I now know the breed are also far easier to identify when out on the hills." Key areas of focus was three-fold – the timings of grazings, the performance of the cows and the stocking density. The lessons learned from the project saw the whole farm go under Higher Level Stewardship in 2007 before entering the Countryside Stewardship Scheme in January this year. Neil now runs 150 pedigree Belted Galloways across the permanent, limestone pasture. While the herd graze on 323ha (800 acres) of grass all-year-round, they are bought down into other fields between May and July to enable the pasture to grow flowers, set seed and allow birds to flourish. The cows are naturally served with the farm’s own stock bull, with the aim to spring calve and follow through for up to four years. Meat is sold through independent shops and meat wholesaler Swaledale Foods. 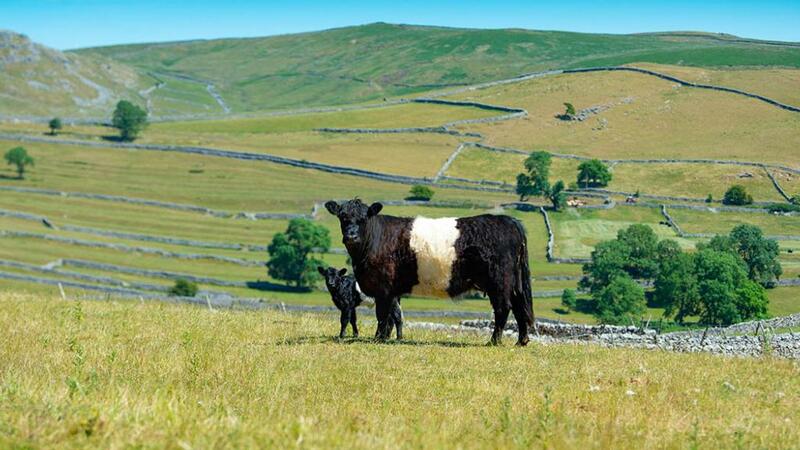 "The Belted Galloways are great calvers, good mothers and absolutely suited to this environment," says Neil. "You get the right breed in the right conditions and they just thrive. "They spend their lives outside and, in absolute extreme weather conditions, are fed. This winter is the hardest I have ever known and yet here we are now working through one of our hottest summers." In 2012 sheep numbers had peaked to 800 and were being sold as Mule gimmer lambs through Skipton auction mart, but both Neil and Leigh were becoming increasingly concerned figures were not stacking up. "That year I had a much closer look at our farming business," says Neil. "We had two areas of focus – the cattle on the hills as part of the limestone project and the commercial sheep flock, where my own interest was and what I thought was the main driver of the farm." "The income of cattle came out at £17,000 and the sheep at £59,000 but, when I looked at the profit, the cattle has made £11,000 and the sheep £479. "Having spent about 70 to 80 per cent of my time working with the sheep, it worked out I was being paid 15 pence an hour. Yes, we were trying to benefit biodiversity and the environment by becoming part of the scheme, but it was the cattle side actually contributing to the bottom line. "It also showed how reliant we were on subsidies, more than we realised, and just how much time I was spending on-farm with a miniscule return. Assured by the benefits of grazing the cattle outside, Neil looked to emulate some key changes and reduced sheep numbers to 400. "We could have completely got rid of the sheep and in some ways that would have made sense but we did not want to see that food production from the area lost," he says. As a result the sheep were healthier and the profits increased despite farming with less numbers. Neil credits the alternative management choices worked once again. "We had a much more extensive lambing period. Whereas before I was lambing in March we relaxed to mid April-early May, we reduced the amount of concentrates and for the last three years no longer require it. We have a lighter lamb crop now who feed on spring grass and we focus on cutting costs rather than maximising output. We are selling them as hoggets at 12-14 months rather than the previous age of six to eight months. "We are trying to replicate what we learned with the cattle and follow their lead rather than forcing them on earlier and increasing our input costs." In 2013, the couple became approved suppliers of both sheep and lamb with the Pasture Fed Livestock Association, and now seek advice when necessary on management and health. "Becoming a member has given me confidence to go ahead and keep doing what we are doing. Sometimes it felt we were in the minority and I have realised other farmers are out there doing the same and it isn’t as unorthodox. And now the association is doing the same with dairy production." Social media has become increasingly important and they now share platforms with Leigh on Instagram as @hilltopfarmergirl and Neil on Twitter and Facebook. Their decision to share the daily activities of a working farm in the Yorkshire Dales, along with their accommodation business, has unsurprisingly taken off and is gaining more traction as the weeks pass. Leigh, who is in charge of the diversification into accommodation, has spent a long time building a picture for the wider world to see and last week was stopped in the village by a Japanese girl who wanted to know where @hilltopfarmergirl lived. "What we do goes hand-in-hand," says Leigh, who joined social media in winter 2013 as she shared their bad winter. "Our guests are arriving and ask about our Belted Galloways or want to know more about how we farm and we really enjoy sharing our stories." While Neil and Leigh know they are fortunate to have identified their role in the farming landscape, they also appreciate the practicalities of a working farm and a need to make a decent return. Neil says: "I have really questioned the route I have taken along the way and certainly other people have not been in agreement. But I believe we are combining farm production with the environment while making a profit. "I have done what is best for us as a family farm business rather than maybe what is expected. I really have learned you can strike a balance and it can work."